Here is a quick (and I do mean quick) family-friendly recipe. Today I had limited time and ingredients on hand to make an after-school snack/meal for my 5-year-old niece and my 15-month-old. I have wanted to make cauliflower crust pizza for awhile and so that’s what I did. 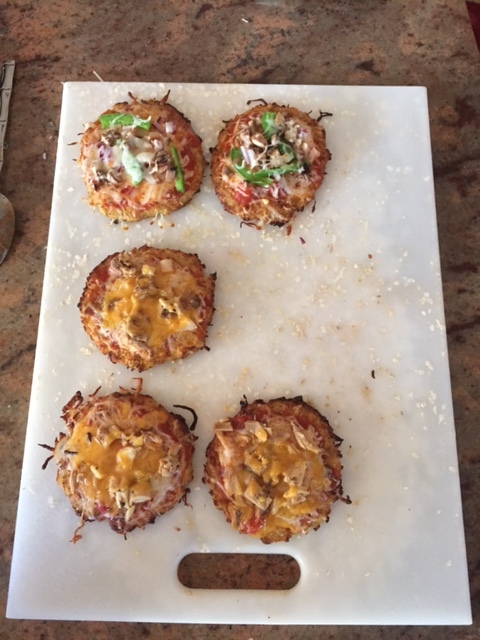 It was really easy and quick and only takes 5 ingredients plus whatever toppings you desire. I’m sorry there isn’t a better pictures, but these little babies went quickly! Separate cauliflower florets from stem. Put florets in food processor until it resembles rice. Or, chop the florets up finely. Transfer chopped cauliflower to microwave safe bowl and heat for 8 minutes. Remove from microwave and add egg, seasoning, and cheese. Stir until well combined. Form dough into mini pizza circles. Bake dough on baking sheet covered with parchment paper for 25-30 minutes until brown and crisp. Remove from oven, top with sauce, cheese, veggies, and/or meat. Place in oven under broiler for 2 – 5 minutes based on how you like your pizza. Great idea! The crust can be the most unhealthy part of pizza besides the cheese.This sounds like it’s worth trying.